[122 Pages Report] The global cloud robotics market is accounted to grow from USD 1.93 Billion in 2016 to USD 7.51 Billion by 2022, at a Compound Annual Growth Rate (CAGR) of 28.1% during the forecast period. This report aims at estimating the market size and growth potential of the cloud robotics market across different segments: components (software and services), service models (Platform as a Service (PaaS), Infrastructure as a Service (IaaS), and Software as a Service (SaaS)), applications (industrial robots, military robots, commercial robots and personal robots), deployment models, end-users (verticals and third-party users), and regions. The primary objective of the report is to provide a detailed analysis of the major factors (drivers, restraints, opportunities, industry-specific challenges, and recent developments) influencing the market growth, analyze the market opportunities for stakeholders, and offer details of the competitive landscape to the market leaders. The cloud robotics market includes companies such as Amazon Robotics (US), Google (US), Huawei (China), IBM (US), Microsoft (US), C2RO (Canada), CloudMinds (US), Hit Robot Group (US), V3 Smart Technologies (Singapore), Rapyuta Robotics (Japan), Ortelio (UK),and Tend (US). 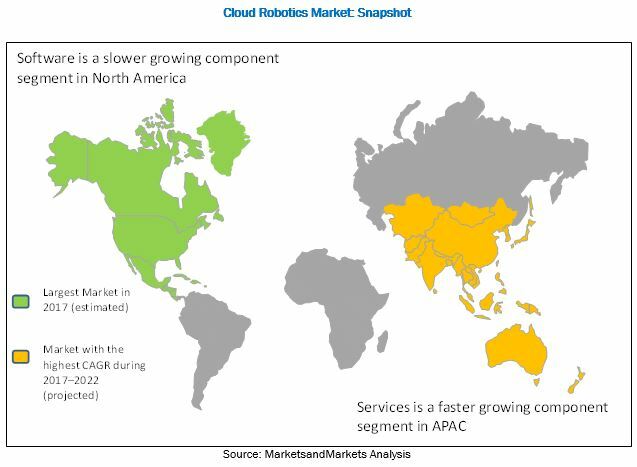 MarketsandMarkets forecasts the cloud robotics market to grow from USD 2.20 Billion in 2017 to USD 7.51 Billion by 2022, at a Compound Annual Growth Rate (CAGR) of 28.1% during the forecast period. 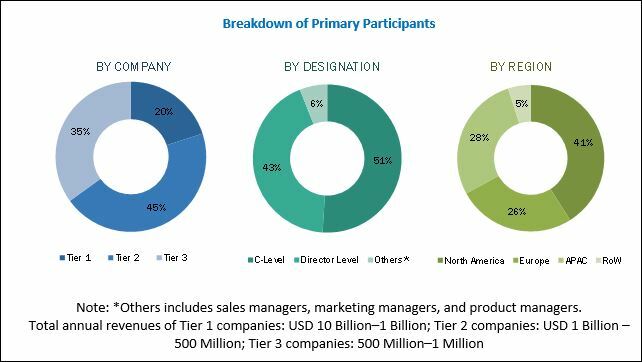 The major factors driving the market growth are the proliferation of the cloud technology, broad spectrum use of wireless technologies increase in the adoption of IoT and advancements in AI and machine learning technologies. The objective of the report is to define, describe, and forecast the cloud robotics market size on the basis of components (software and services), service models, applications, deployment models, end-users (verticals and third-party users), and regions. In the components segment, the software segment is expected to have the larger market share during the forecast period, due to the rapid need for developing businesses and building better applications and the changing database environment. This is expected to result in the need for advanced and flexible robot cloud software solutions for addressing multiple challenges. In the services segment, the training and support services segment is expected to grow at the fastest growth rate during the forecast period. These services are designed to provide a wide range of service offerings that help meet the specific needs of customers who require maximum benefits from their hardware and software. These services also assist the robot manufacturers and integrators in successfully implementing cloud robotics solutions. In the deployment types segment, the public cloud deployment type is expected to carry the largest market share as compared to that of the private and hybrid cloud deployment types. Most of the cloud robotics developers prefer using the public cloud deployment model, because of its cost-effectiveness and benefits. The public cloud is highly scalable, flexible, and cost-efficient as compared to the private cloud. The public cloud services may be offered free of cost, or on a pay-per-use model, depending upon the requirements of the end-users. The cloud storage providers prefer the public cloud deployment model the most, due to the ease of access and faster deployment feature. In the verticals segment, the manufacturing vertical is expected to have the largest market share in the cloud robotics market in 2017. The demand for robotic machines is continuously increasing among manufacturers, as they are looking for ways to improve their operational efficiencies as well as mitigate their costs. In the manufacturing industry, robotic arms are used for replacing manual labour. Manufacturers are taking benefits of robot simulations, which are increasing the efficiency of production processes, quality control, predictive maintenance, and product innovation. This also helps companies in reducing the production time as well as the costs associated with it. North America is expected to have the largest share in the cloud robotics market during the forecast period. The reason being, the majority of vendors, such as IBM, Microsoft, Google, and Amazon Robotics, are based in North America. The region is also expected to account for the major market share and considered the most advanced region in terms of cloud, AI, and machine learning technologies. The region witnesses many R&D activities in the field of robotics for o bringing advancements to cloud computing, AI, robotics, and machine learning technologies. Asia Pacific (APAC) is expected to grow at the highest CAGR during the forecast period, as the region is home to a creditable amount of manufacturing units, which are gradually embracing the adoption of advanced technologies, such as cloud robotics. The proliferation of cloud technology, broad spectrum use of wireless technologies and smart devices, increase in adoption of IoT, and advancements in AI and machine learning technologies are expected to drive the growth of the cloud robotics market. However, data privacy and security concerns, and high initial costs and R&D expenses may hinder the market growth and act as a restraining factor that can hamper business-critical functions in the market. The major vendors in the cloud robotics market are Amazon Robotics (US), Google (US), Huawei (China), IBM (US), Microsoft (US), C2RO (Canada), CloudMinds (US), Hit Robot Group (US), V3 Smart Technologies (Singapore), Rapyuta Robotics (Japan), Ortelio (UK), and Tend (US).